Looking for ways to cut down on your wedding budget? Did you know you could totally do wedding flowers on your own, particularly those meant to be centerpieces and bouquets – without being the source of mirth? On the contrary, beside the cost-effectiveness of the project, you’d enjoy adding this personal little touch. And did I mention they’re easy? Yes, table centerpieces for wedding receptions can easily be made at home whether you choose to do it yourself or with the help of friends. We should add that there’s a thriving industry in wedding centerpiece rentals. Consider that as one way to reduce costs…but don’t forget the sense of achievement from making your own. Want to choose flowers according to the season but worried about making a mistake? Worried that they might not last long enough and end up costing you more money than you hoped to save? We’ll be discussing tips to make amazing wedding flowers, both personal and professional tricks for neat flower arrangement that you get to learn for life! 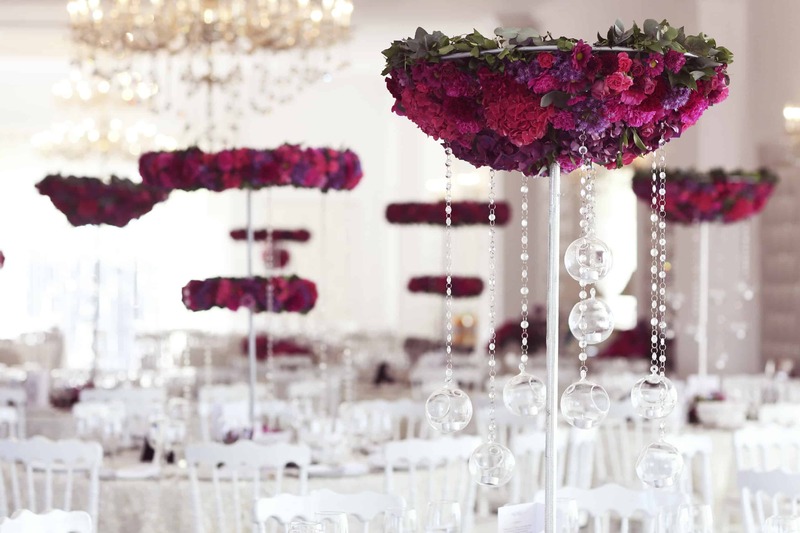 So for a modern and fulfilling wedding flower experience, here’s what we suggest. I guess it’s occasions like weddings that make us learn more about these intricate floral delicacies. For example, have you ever wondered why Ranunculus, Lillium Casablanca, Stephanotis, Dahlias, and Tulips were reserved for January? Or varieties like Iris, Larkspur, Kangaroo Paw, Sunflowers, and Magnolia would look great in February? Now you may already have a favorite flower to incorporate or you may be looking for one with special symbolism. Peony, for example, stands for a happy marriage, prosperity, and good health. Orchids signify refinement and beauty. You may want to consider classic choices like Calla Lilies or you can simply be seeking value for money with the Hydrangea. Ask a florist for some local context and quotes. If your favorite flower isn’t in season during the wedding month, then you’ll either be importing (and paying a premium for it) if you’re not flexible, or you’ll have to choose another instead. Hint: Roses are always in season. Most people assume they can arrange their flowers in a perfect combination. One word for you: don’t. Quite simply, it’s probably not something to which you are accustomed on a daily basis Sometimes, simple really is better. And we’re not just referring to how complex arrangements overwhelm you, your fiancé, and/or your helpers. Avoid complex arrangements but plan in advance so the décor is according to your circumstances, situation and preferences. Label the jars with the number of stems and type of flowers to save time and stress on the big day. Planning ahead and enlisting help of guests, including bridesmaids, their partners, your cousins and aunts mean you finalize both the wedding centerpieces and wedding bouquet in plenty of time. Where some people are afraid to touch a flower bud for fear of causing damage, others also worry how to avoid having a sickly DIY arrangement prior to the wedding. The latter would find the following pretty useful. You may have been inspired by someone who did their own wedding bouquet, rather than buying it from a store. You can learn so much on what not to do when attempting these projects! For one, if you’re hosting at location with a scenic surrounding or a venue with breathtaking views, be careful about tall and large wedding centerpieces, which may bring focus more on the individual table setting than the beautiful reception location. Select lower and loose-style arrangements and ones featuring lush greens to stretch their size. Second, there are people who waste money on flowers simply because they refuse to reuse the ones at the ceremony for their reception. Consider that – your aisle flowers can easily be turned to wedding centerpieces and the ones by the altar arranged around the buffet. This, of course, assumes you have help and time moving them and may not work for everyone. Third, don’t rule out ‘expensive’ flowers. Sometimes a single bloom can have a greater impact than a bouquet of their affordable siblings. Think one Cattleya Orchid compared to a bunch of roses; you can use them sparingly. Fourth, with respect to the colors and scents, don’t go with a strictly monochromatic scheme (e.g. matching the flowers with the color the bridesmaid dress) and avoid strongly scented items. When it comes to bouquets and centerpieces, be careful not to choose oversized bouquets (it’ll hide your dress). Choose the right table linens to complete and make your flowers flourish. But don’t forget to give it a personal touch; an antique pine, a swath of lace, light feathers anything would do. YouTube guides (e.g. by Bride De Force) and Pinterest are good resources to check out for ideas. These tips aside, remember that flowers, and homemade wedding bouquets in particular, express your personal style. There’s no rule to follow. Do it your way.